This paper describes various ways of increasing the efficiency of a mechanical refrigeration system. It compares the cost of operation with capital costs. Relative energy usage of the various cryogenic refrigerants is discussed in comparison to mechanical refrigeration systems. An analysis of the costs to, chill beef using the conventional methods, using hot boning methods and using a suggested chill pack (-2°C) method indicate substantial savings in energy. During the last three decades, most process industries have been expanding energy in lieu of capital. It was always easy to justify the lowest price. Almost invariably the low priced refrigeration system had much higher energy requirements than the system with the higher cost. This type of approach was, and is, brought about by a tax system where energy is an expense and capital investment must be depreciated over a prolonged period. With low-cost energy, this approach is easy to justify. Now, however, the cost of electricity and most other forms of energy are increasing at such a rapid rate that the plant owner is forced to start investing capital to conserve energy. In order to put this into perspective, let us compare a mechanical freezing system which freezes 2727 kg (6000 Ibs. of cooked meat portions per hour. In 1970, this system would cost approximately $235 000 and require some 400 kW including compression equipment and all ancillary fans, pumps, and other electrical requirements. In 1970 the cost of electricity was around 1cents kWh', so a 4000 h year* operation had an electrical cost of about $17 000 yearly *. (Table 1). In 1979 the capital cost has become $470 000 and the cost of electricity has risen by five to seven times. At 5 cents kWh* and a 4000 h year* operation, the electrical cost would be about $85 000 yearly *. At this point, the plant owner must start to analyze the cost of additional factors designed to reduce the electrical energy requirements. In most cases, an additional investment of about 5% to 7% will reduce operating costs by 15% to 20%. As electrical rates increase from 8 to 104 kW', as they have in some areas, every plant owner will be forced to pursue every avenue to keep electrical operating costs well below what most people have considered normal. When you invest in a refrigeration system, power consumption is vitally important. Consider the possibility of 10% inflation per year, 20 years of plant life, a 92% efficient motor, and 3q kW* electricity, and 24 h d operation. Under these conditions, 7.46 kW would cost approximately $153,740 in electrical energy over the 20 year period. 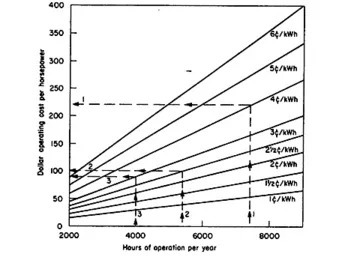 If you only operate 2500 h year-' in lieu of 8700 h, the cost is $44,178. Thus, when you analyze a refrigeration system you should compare the total cost of owning and operating, not just the capital investment, (Fig. 1). 1. Select the most efficient refrigeration compression equipment available. 2. Select evaporators with ample coil capacity and be sure to install a demand-defrost system for defrosting all coils in rooms below 2°C. During hot gas defrost, an evaporator coil uses twice the energy used during normal operation and this is under ideal conditions. Most existing defrost systems for evaporator coils are time activated. Thus, many coils are defrosted much more often than required. Demand defrost is initiated by the air pressure differential across the coil. As frost builds the air pressure increases and activates the defrost cycle. 3. Install a good oil management system. Remove the oil from the refrigerant before it gets to the evaporators. Oil in evaporators decreases evaporator efficiency and in turn decreases the system efficiency. 3 - if 15 HP; 0.75 efficiency, 4000 h, operation © 3cents kWh' from graph $/HP = 90 then 90 S/HP x 15 HP)/0.75 efficiency = $1800 year-'. Estimating motor efficiency: 0.92 - 100 HP and upwards; 0.88 - 20 HP to 100 HP; 0.85 - 5 HP to 20 HP; 0.75 - 1/2 HP to 3 HP. 4. Arrange the system so that it can operate at low condensing pressure during off-peak ambient conditions. By operating at a pressure of 687 kNm** (100 psig) during condensing instead of 1275 kNm** (185 psigl, the design value, the energy requirements are reduced by 30% or more. 5. Install a programmable computer to control the entire refrigeration system. Operating costs have been reduced dramatically by proper programming of all system functions to use the minimum of energy. 6. Initiate a maintenance and operation system geared to the efficient use of every kilowatt of electricity. Good maintenance of the refrigeration plant will reduce the use of energy. 7. If your plant requires hot water, another energy saver is a heat recovery system. This principle could be applied at the following stages; at high stage compressor discharge; booster compressor discharge; in the refrigerant condensing system; at the screw compressor oil cooler and at the reciprocating and rotary compressor jackets. In general, incoming water can be heated from 10°C inlet to a maximum of about 60°C. In an ammonia system, approximately 0,7 kWh of heat can be recovered for each compressor kWh power for boiler make-up, scalding systems, clean-up, and domestic hot water, etc. Mechanical refrigeration is the least expensive way to chill or freeze a food product. It uses less energy than any other system. What follows are some basic comparisons between mechanical refrigeration, liquid carbon dioxide, and liquid nitrogen. The costs of liquid carbon dioxide normally vary according to the plant location and transportation costs. However, in general, the costs vary from 24 pounds' to 3 pounds' delivered and as energy costs increase these prices must rise. The production of liquid carbon dioxide is energy intensive. The electrical energy required to produce liquid carbon dioxide equivalent to that provided by a mechanical system is more than double. And this is just the start. Some five to seven years ago the cost of transportation of liquid carbon dioxide exceeded the cost of production and nowadays the cost of gasoline and diesel fuel is going up even more rapidly. Liquid carbon dioxide costs will rise and probably at a rate much faster than electrical costs. designed to produce oxygen for a chemical or another process. Assuming that the pure nitrogen is available free, the actual electrical energy required to produce an equivalent amount of cooling as a mechanical system is approximately ten or more times. Thus, the costs are certain to rise at a rate much higher than mechanical systems. Again, liquid nitrogen is normally transported by truck or rail and this cost is rising at a rapid rate. In general, if we assume the costs of mechanical freezing may be scored as one, using liquid carbon dioxide would be scored as two or three, and with liquid nitrogen, the cost would be four or five. For some reason, we in the refrigeration industry have been trying to freeze everything that comes along in the area of food products since it was discovered about 1848 that food could be preserved by reducing its temperature to - 17°C and could be preserved for long periods of time. Quite often we forget that not every item needs to be frozen to be preserved for the time period to which existing distribution systems are geared. Sometimes we forget that the objectives are to: provide a quality food product geared to the existing distribution system; keep the price at a minimum; and use the minimum amount of energy. For many years the poultry industry in the US distributed poultry in the form of whole birds packed in ice. This is not a very ingenious system as each pound of ice pack poultry required about one-half pound of ice during transportation to the sales outlet. The temperatures of the delivered products were not consistent and varied from 0 °C to 4°C, and above. Obviously, transporting 33.3 percent more weight than you sell is self-defeating and expensive. As a result, considerable research was done indicating that frozen poultry was the way of the future. However, some poultry producers decided to take a different approach. The demands of the supermarkets were directed toward prepackaged and pre-priced poultry 'Ready for Sale'. 'Chill pack', a product that was equilibrated at - 2degree C was a good answer. Today, about half the US poultry pack is produced this way and the percentage is rising. This product is produced by transporting the packages through a continuous freezer for a predetermined time depending upon the type of package. The average time is about 50 mm. The product is stored at - 2degreeC. This prepackaged product has a far superior shelf-life to ice pack poultry. Chill pack poultry is produced on several types of automatic or semi-automatic systems. The selection of the type of system to be used is basically related to the customer's product handling system. A semi-automatic system employs a multi-track tunnel freezer (Fig. 2) with each track driven independently by a variable speed hydraulic drive, so that different sizes of packages with different time requirements can be chilled to -2°C. Additionally, products can be frozen on one track while two tracks are used for the chill pack. The packages are transported through the tunnel in nesting plastic trays which ride on a dolly. The dollies are then moved manually into a -2°C storage room which holds several days production. The product is unloaded from the dollies, pre-priced, packaged in a master carton and loaded on the delivery truck. An automatic system would normally employ a continuous freezer in which packages are transported through a -30°C atmosphere of high-velocity air on a conveyor. This system requires that the packages be put in a master carton before storing in the - 2°C holding room. It is not as versatile as the tunnel freezer as all sizes of packages is in the freezer for the same time. Although this system eliminates some labor, it's the capital cost is approximately double that of the tunnel freezer. Some processer's try to use blast freezers to produce chill pack. This is usually unsuccessful because it is most difficult to control the time that the product is in the freezer, thus some of the product is frozen and some is not properly chilled. Good chill pack products require precise control. The alternative to a chill pack product could be a frozen product. Let us compare the energy costs of each approach. The heat removed from the bird for a chill pack is approximately 110 kJ kg*. For freezing, the heat removed is about 300 k J kg. From this relationship, you would expect the cost to be about 2.6 times more to freeze than to chill pack. However, when all factors are considered, the actual cost is about 2.3 times more. For example, using 34 kW electrical power the energy cost of the chill pack is 0.13 cents kg and for freezing it is about 0.31 kg -. Capital costs for equipment would follow at a ratio of about 2.5 to 1 for a freezing system versus a chill pack system. Besides the reduced cost of production, the cost of transportation and storage costs are less for the chill pack. For example, the relative energy cost for -2°C storage versus -23°C storage is about two to one, assuming identical heat loss. The basic difference is that the electrical requirements are 1.9 kWr IH* at -29 degree C and at -8 degrees C at 1.0 kWh TR*, for all electrical motors required. The red meat industry has for many years been geared to the distribution of an approximately 1.7degreeC product either in carcass form or boxed. Most recent studies regarding hot boned beef indicate some interesting savings in energy costs. By eliminating the bones, excess fat, etc., the heat removal is reduced by 32% over intact sides of beef. There are other factors affecting the energy requirements and total savings using this system. Assume that the hot-boned beef is vacuum packaged in portions of similar size and weight, and boxed. Quick chilling in an automated carton freezing system (Fig. 3) would have advantages. It would minimize shrink, and the product could be chilled within eight to ten hours to -1.7degreeC equilibrated, assuming that air temperatures from -29 degrees C to -32 degrees C were used. According to data published in the ASHRAE Data Book, conventional beef chill operations have net weight losses from 0.7% to 1% in the chill room, and holding room losses from 0.6% to 1 % for a 48 hour holding period, ie a total of from 1.3% to 2%. This type of shrink should be practically eliminated with the hot bone and quick chill system. It is suggested that the product should be chilled to approximately -1 to -3degreeC and remove some 1/3 of the latent heat. The product should then be maintained at -1 to -3degreeC during the distribution cycle. Little change would be required as most trucks and stores could be operated in this range if they presently operate at 0.5 to 2degreeC. Most red meats take 20 to 25 days from the kill floor to the customer. Its shelf life is 2.5 times longer at 0.5degreeC than at 4.5degreeC. Using a chill pack system the shelf life should be many times better and the product could be delivered at least two to three days sooner due to the shortened chill time. Little data is available on the use of chill pack in the meat industry in the United States. However, we anticipate a trend in that direction as energy costs increase. If we compare the cost to chill beef in a conventional manner with chilling hot boned beef, the result is as follows. Assuming 40.6degreeC product in, and using the example in the ASH RAE Guide, (Chapter 28 (1978)) which describes a design for 520 carcasses weighing 254 kg each or 132 000 kg per beef chilled in 20h and held for 48 h, using .03 kW-' would cost approximately $139.00 l$1.05 -1) and take three days. Chilling hot boned beef employing a compound compression system, an automated carton freezing system and assuming 10 h to chill from 40.6degreeC to 1.7degreeC, the cost for 132 t, less the 30% bones, trim, etc., would be about $90.00 (94 t-1, net or 6ft t-1, gross) on the same basis as the above cost (Table 2). This electrical energy saving of over 50% is paralleled by a reduction in space required from 1435 m2 to about 278 m2, a 60 h reduction in inventory requirements, and a reduction in capital investment. Depending upon the handling method, it is estimated that the automated hot boned beef chiller could be installed for a capital cost of 10% to 20% less than a chill room and a 48 h holding cooler. Labour would be reduced also, depending upon the packaging method and the chilling system employed. Most importantly, as previously discussed, these savings are in addition to a 1 % to 2% shrink saving. The meat industry should move in the direction of the chill pack to take advantage of additional shelf life and less spoilage. Based on the same example, the cost to chill pack at -2degreeC assuming removal of 70 kJ kg-1 of latent heat would be about $1.07 t. Thus, we could chill pack for about the same energy as we use now. The chill time would increase by two to four h over the hot-boned chilling time. However, the installation costs should still be well below the conventional chill room/holding room methods. The cost to freeze would be 2 to 2.3 times the cost to chill pack. The cost to store at -23degreeC would be two to one versus -2degreeC storage. It is recommended that air temperatures of -29degreeC to -32degreeC be employed for chilling a product to -2degreeC. As the low air temperature will seal the surface of the product rapidly and will eliminate much of the 'drip' loss normally associated with chilling meat products, it will also decrease the chilling time and the initial cost of the conveying mechanism.